Movie Review: “Theeb” is a notable tale set in Jordan about a Bedouin boy – the title character - who's the younger son of the former sheik of his tribe. He embarks on a perilous adventure along the unruled desert when he follows his older brother without permission. If we exclude the brief and yet strong participation of the British actor Jack Fox, this incisive drama is a film of newcomers. Both the Arabic cast and the director, Naji Abu Nowar, who co-wrote with Bassel Ghandour, accomplished their roles in such an extraordinary way that I could never tell this was their first movie. Following the tradition of receiving guests with courtesy, the Bedouin tribe welcomes an Englishman named Edward, who asks for a guide in order to reach a well, located in the middle of the desert. The parched trail to get there is more crowded with ferocious raiders than honest pilgrims, and therefore, the best man to conduct the expedition is Theeb’s older brother, the brave Hussein, who keeps raising him as a son after their father’s death. We can sense the sadness in Theeb’s eyes when he sees his brother on a camel, disappearing behind the rocks. Suddenly, in an uncontrollable impulse, Theeb sets off after his brother, finding him camping with the arrogant Edward, and the translator, Marji, an old acquainted of the tribe. With no other immediate option than taking the stubborn Theeb with them, the three adventurers are surprised when they reach the intended location. The well was clogged with slaughtered men and, later on, they’re ambushed by a group of bandits that wanted their camels. The brothers climb the mountains in a do-or-die effort to escape the enemies’ shots. Hussein hits one of the guys in the leg, but in the next morning he’s found dead by his little brother who managed to escape the oppressors when he fell inside a well. 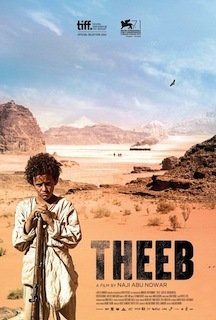 Alone and hungry, Theeb seems abandoned to his own luck, when he suddenly sees a camel coming in his direction, carrying an unconscious man who, believe it or not, is the thief his brother had wounded before. What to do when, in this ominous case, the enemy is your only way to stay alive? Visually resembling “Timbuktu”, but lacking its witty humor, the film slows a little bit in the last third. However, Mr. Abu Nowar, awarded best director in Venice, overcomes that phase by engendering a staggering, strong finale. The effective combination of chamber music and oriental melodies simultaneously enhance the tension and the drama while the marvelous landscapes, counterpointing to the atmosphere of tragedy, are a rich asset for the beautiful cinematography by Wolfgang Thaler (Ulrich Seidl’s habitual).